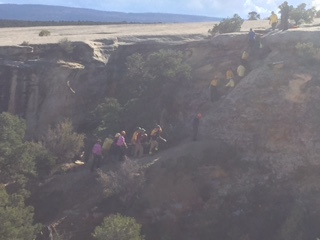 Rescue crews from the Grand Junction Fire Department responded to a hiker that fell approximately 20-40 feet off the Ribbon Trail located just off Little Park Rd. 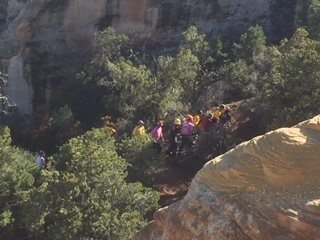 Crews were met by the hiker’s friends at the Ribbon Trailhead and were directed to the exact location of the hiker. 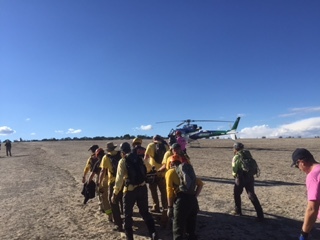 Mesa County Search and Rescue arrived shortly after to assist. 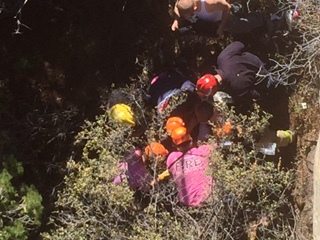 Crews were able to reach the hiker very quickly and provide immediate stabilization care. The hiker had injuries to the extremities consistent with a fall of that approximate distance. 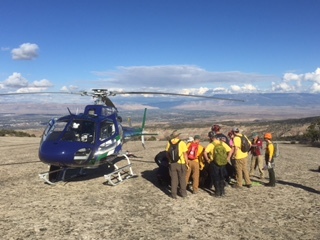 Crews loaded the hiker into a Stokes basket to ensure safe extraction from the deep valley they were in and requested St. Mary’s Careflight helicopter to assist in the transport to the hospital. There were no injuries to the emergency responders on this incident and the circumstances surrounding the hiker’s fall is unclear. Safety Note: It is very important to carry a cellphone while hiking our beautiful trails. There is cell service surrounding the popular hiking areas. There will be no further updates regarding the hiker/patient due to HIPPA laws. Previous postMotorhome Fire: 642 29 1/2 Rd.